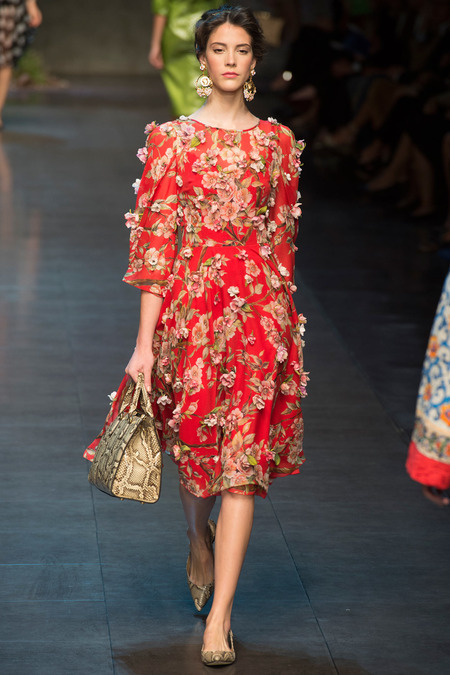 Dolce & Gabbana had one of the outstanding collections during Milan Fashion Week. Folks are still talking about the last look. It’s funny, Dolce & Gabbana is a house I’ve appreciated for it’s tailoring, marketing, and red carpet looks, yet for some reason I never paid much attention to their RTW. Unlike most houses that are expanding like crazy, especially into the cash-cow lower priced lines, Dolce & Gabbana closed down their very profitable D&G line in 2011. They said one reason was the desire to get back to basics. In getting back to basics, they’ve also returned to Sicily. The island has had a strong influence on the designer’s work (Dolce is Sicilian and the two have a house in Stromboli). When I finally made it to Sicily, I understood how and why the island drives their creativity. I cannot wait to explore more of it. This collection has convinced me to at least think about adding some florals to my spring/summer wardrobe. I never wear florals. I like to keep things simple and clean. I’m short and don’t want to look like Great Auntie Gertrude’s sofa. This dress is so not my style. I cannot stop looking at it. Is it the color, the cut? I don’t know but I’m loving this Sicilian almond blossoms dress. I love the red too! Like you, not sure I would or could wear it but there are other pieces in the collection that I could see rocking next spring/summer.